In 2014, Lyndon Neri and Rossana Hu were named designers of the year by Wallpaper, largely for work they had created under the name of Neri & Hu Design and Research Office. The duo founded the firm in 2004 in Shanghai, with an additional office in London, and for more than a decade now it has been the source of incredibly creative, innovative architectural designs for projects around the globe. 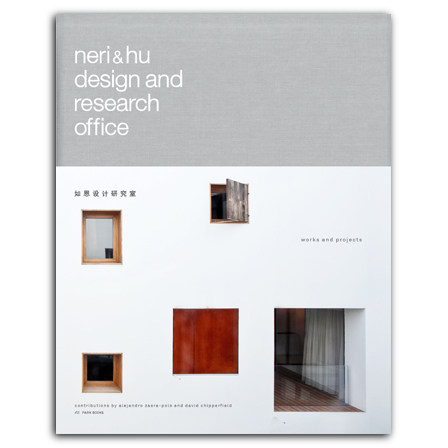 The first book ever published on the firm, Neri & Hu Design and Research Office presents a broad selection of its work in architecture and product design. The projects covered include seven renovations in Shanghai; three retail spaces, including Neri & Hu’s own office building; beautiful designs for a tea service, chair, and picnic basket; and several major ongoing projects, including a private residence in Florida and hotel renovations in London and Shanghai. A lavishly produced book, with contributions from Alejandro Zaera-Polo and David Chipperfield, Neri & Hu Design and Research Office is a testament to a firm working at the height of its powers. , born 1953, graduated in architecture from Kingston Polytechinc College and the Architectural Association in London. He worked at the practices of Douglas Stephen, Richard Rogers and Norman Foster, before establishing his own studio in London in 1984. His best known works include the River Rowing Museum in Henley-on-Thames, the Museum of Modern Literature in Marbach (Germany), and the reconstruction of the Neues Museum in Berlin. studied architecture and music at University of California, Berkeley, and Princeton University. She worked with Michael Graves & Associates and Ralph Lerner Architect in Princeton; Skidmore, Owings & Merrill in New York; and The Architects Collaborative (TAC) in San Francisco before founding Neri & Hu Design and Research Office. studied architecture at University of California, Berkeley, and Harvard Graduate School of Design. Before founding his own firm with Rossana Hu he has been working for more than ten years with Princeton-based Michael Graves & Associates and various architectural firms in New York. , born 1963, is an architect and founder of the London and New York-based firm AZPML. He is also a Professor of Architecture at Princeton University’s School of Architecture and a visiting professor at Ravensbourne London.